A magical location for outdoor activities, educational field studies and training courses in excellent accommodation. Wern Watkin is a stone built smallholding. The bunkhouse sleeps up to thirty people in seven fully en-suite bedrooms. There is a massive dining room/seating area and a wonderful outdoor space opening out onto ancient woodlands. 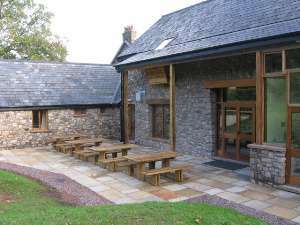 There is under-floor heating throughout, excellent drying facilities and ample hot water.